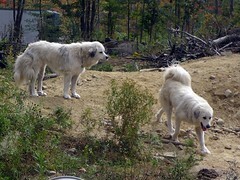 Something clicked in the brains of the big white puppies, Buffy and Faith, within the last 24 hours. I’m so excited and happy I can hardly stand it. We’ve had to keep them under such tight control, because they weren’t safe around the birds. We’d gotten them (mostly) to the point of not killing demons turkeys, but chickens were still fair game, as were ducks and geese. If they’d get out, they’d kill birds, and it was driving me sort of batty. How else do you get a dog bird-safe except constant exposure and correction? Then a couple of days ago, both Buffy and Faith started climbing the fence in their area, out into the garden. They still stayed contained because the fence around that is pretty secure, but then all of a sudden if a party started happening, like the pigs got out or something, Faith would start to show up. How was she getting out?! It turns out there was a hole in the plastic on the greenhouse, next to the garden, and I watched her go through it to join in. Aha! But she was being so good when she was out that I started to let her stay out. She followed Maggie around. She had far better impulse control than Buffy. She didn’t chase birds. Then Buffy followed, and after only about 24 hours of craziness, she too settled down. No more chasing birds. They hang out with Maggie and are useful. They follow us around as we do chores. They sleep in the middle of the road during the day and only wake up when there’s an issue. I’m so glad Maggie has some backup! We are almost at the worst time for predation, and we can hear the coyote nearly every night. I don’t like the thought of Maggie out there on her own. The only thing that is a bit hard to handle is that neither Buffy nor Faith understand why Disa and Bjarki get to go inside the house. When they were in their area, they never tried. But now, they keep knocking at the front door and I keep wanting to let them in. It’s raining! They could go into a shed, but why not come in here with me? I love them too, but everyone has their job on this farm, and they can’t protect the critters if they are couch potatoes inside the house. how did the dig in go????? 2400 feet of fence was run, two sides of the paddock. Yay. and the food, did they love it?